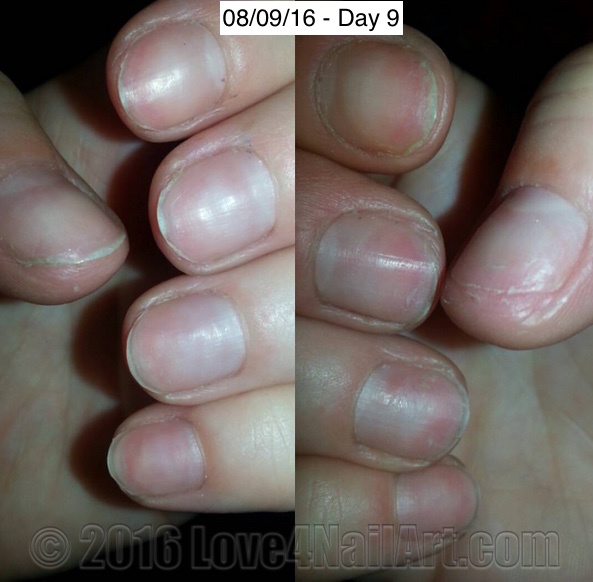 Here marks Day 9 of my nail growth journey. As you can probably tell, my nails look worse than they did on day 1. Unfortunately, my nails are so weak & brittle they just keep breaking, chipping & splitting. I am determined to complete this task I have set ahead of me. Finding motivation within to overcome all the struggles & set backs. I can personally say that it is frustrating. They continue to break both at home & at work. I try my best to be aware of my hands and nails at all times. I have been using gloves when I cook, clean & do dishes. I have also been moisturizing 3-5 times a day. Sometimes more if I am home or around items I can use to moisturize. I have decided to place an order on ebay to purchase a few items to help assist me on my journey. Once those items arrive I will post a haul of the items as well as reviews. Stay tuned for another update coming soon! I will also update you when I have changed my nail care routine. As of right now, I am staying away from anything on the nails. I am only focused on moisturizing & hydrating my nails & cuticles as they grow. I have continued to use the same items as listed in my 1st Nail Growth Journey post.